Size? 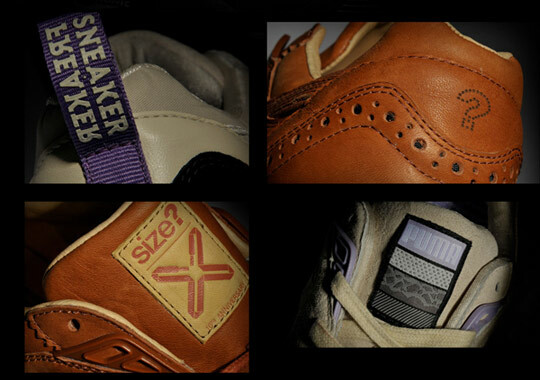 have come together with SneakerFreaker and Puma to bring a very special ‘Reaction Pack’ of R698s into the world. As part of the celebrations of Size’s 10 year anniversary, this 3-way collab looks to be leagues ahead of what has been released already. 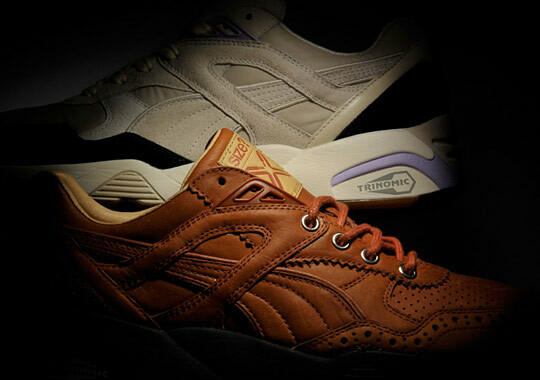 Featuring two make-ups of Puma’s R698 shoe, it would appear that one is hosted by SneakerFreaker and the other by Size? … leading to two very different shoes. SneakerFreaker have gone with a Purple / Grey / Black colour-way mixing leather, suede and synthetics to create an unbelievably effective shoe, whilst Size? have gone for a Brogue interpretation of the R698 using a rich Brown leather and Brogue detailing. They are two very different shoes, but sit so perfectly beside each other. Unfortunately, these are the only available images of these kicks as Size? have been keeping 10 year anniversary details very tight, but full pics will be online when they hit stores on the 14th of August.